Now today was the big match day. Big, not because it was a Cup final or anything of the sort, but at least it was going to be the team’s first game. Let us not make any mistakes about it, this team would be naïve, very naïve. A few of them had never in their lives played any opposition outside Nigeria; almost all of them had never played any opposition outside Africa, so it was that big a game for them. But we woke up as usual… if we didn’t wake up it would have meant we all died and if we all died it would have meant I didn’t write this diary and if I didn’t write this diary I wonder what you would be ready now. Sorry, I digress. I’m usually like this on Thursday mornings. First up was the Mestalla where the club chairmen, or owners as they love to tell themselves were billed for a lecture by Peter Draper, Valencia CF’s Commercial and Marketing director. He taught the chairmen on how to make their clubs commercial success. He started from the fundermentals asking the chairmen what their dream for their clubs was. When they all agreed that their individual dreams was for their clubs to be the best in Nigeria/ Africa he then gave a detailed lecture on how this can be achieved. From getting the right facilities, getting the administration right to investing in a playing or training structure that encourages the best talent to sign. He also noted the big three revenue bases for top football clubs. 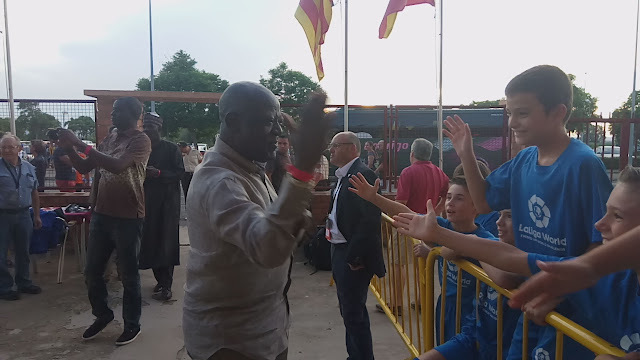 While the lecture was on, president of Valencia CF, Chan Lay Hoon popped in to say hi and was really excited at the number of people from Nigeria who were at their base and hoped the partnership would last longer. 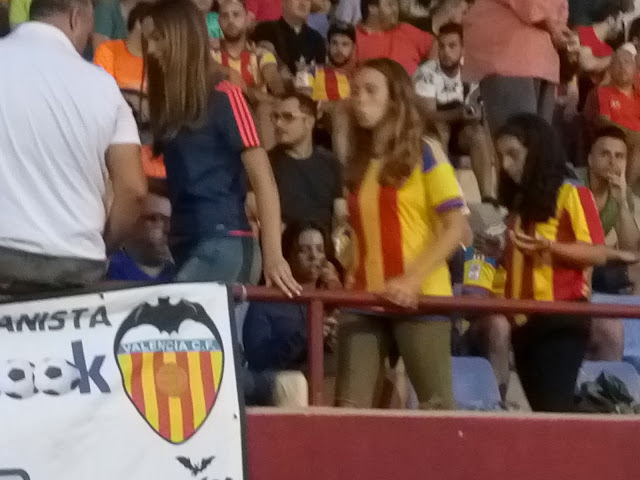 When asked if Valencia CF would come to Nigeria someday to play pre-season games she smiled and said it is something they have to think about. 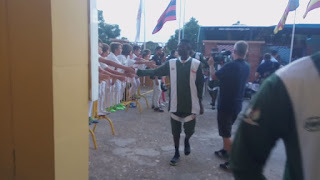 After the lecture I saw Mike Idoko of Lobi Stars in the team bus going over his notes again and again as though he was about to write an exam. I was encouraged because it showed he was trying to take something home from whatever he had been taught. Hopefully, we see those changes at Lobi Stars soon. 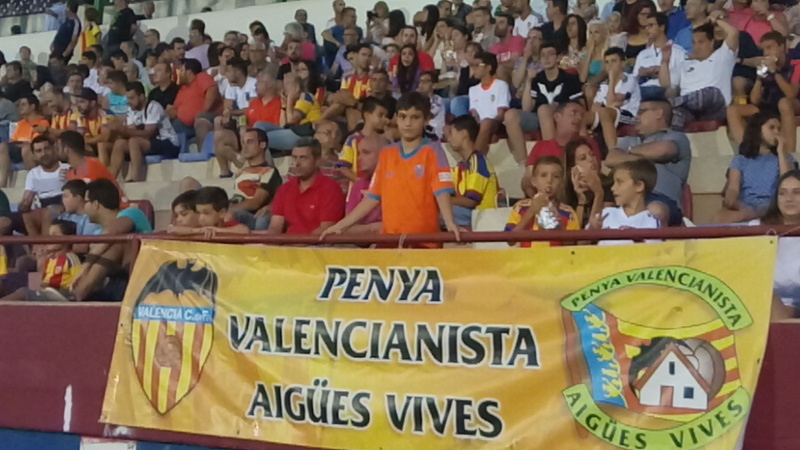 There was something about Valencia CF’s home ground… something you do not get in any stadium in the Nigerian league. There is this nostalgic feeling when you walk in, as though you are in hallowed grounds. I’m sure it did not just happen by accident… they made it that way. The stadium is designed to make the fans know it’s their home and this ranges from the paintings of big players who have featured for the club to markings of trophies they have won in their time as a club and of course to the way the stadium is built. The terraces are almost at 90% angle and so high up in the air making one feel that you could fall off forward while celebrating a goal. It’s almost like the Signal Iduna Park in Dortmund. On our way down after the one hour session I noticed the walls of the office had historical pictures in frames from the clubs archives. The one that intrigued me the most was that of Mario Kempes, the Argentinean forward who was top scorer at the World Cup in 1978. 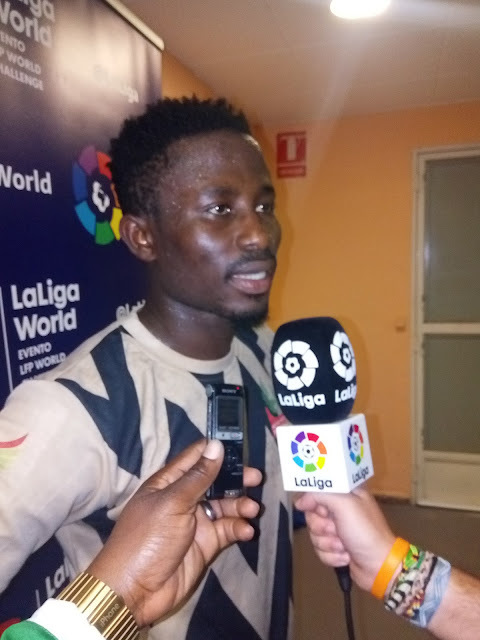 I had almost forgotten he played for Valencia. That was a good reminder. No stadium in Nigeria has photos of its past players on the office walls, not one. So how do the fans relate? How does a young fan in Port Harcourt somehow know of the great players like Finidi George, Rowland Orufe, Raymond Quarcopome and Kayode Solomon? 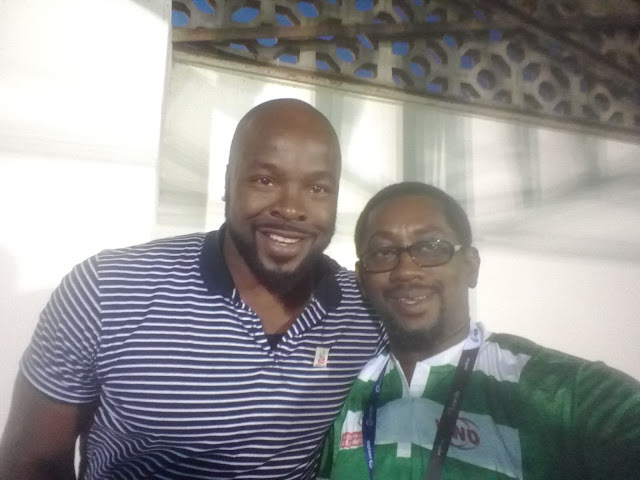 How does the young fan in Owerri know of Sylvester Okparanozie, Kevin Onwana or Tony Merenini? How does the young fan in Enugu know of the Onyedika brothers, Christian Chukwu or the Atuegbu brothers or even the likes of Sani Adamu in Jos? Our clubs chairmen need to return home from this training and begin to show working. 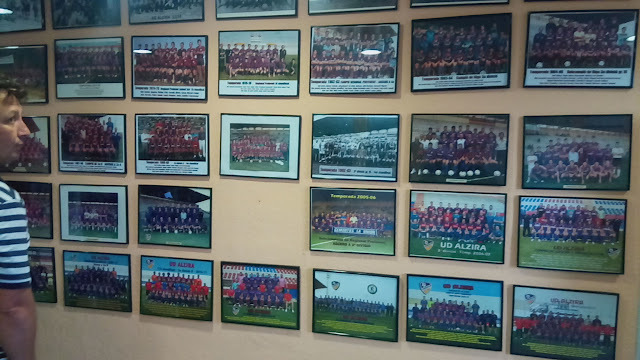 Some may talk of the Warri City Stadium but the truth is that it is not owned by Warri Wolves but the Delta State Sports Commission but it has photos of past sports men of Delta origin… I doubt if there is any from Warri Wolves, but kudos to Delta State anyway. 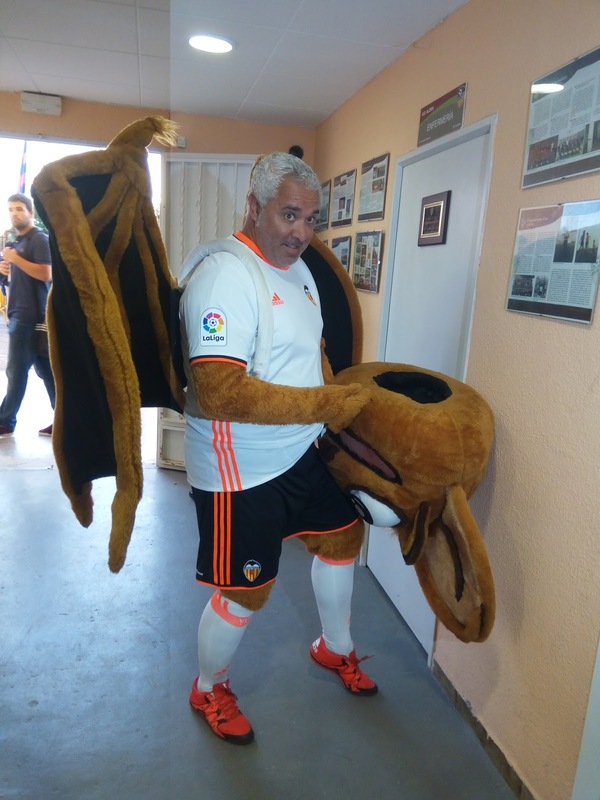 As we made our way out, most of the club chairmen decided to shop at the Valencia CF shop and while they picked stuff ranging from jerseys to trainers I wondered if they knew they could create the same for their clubs. 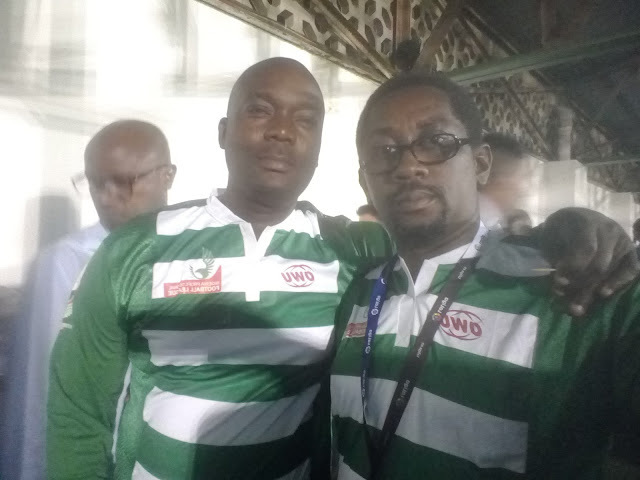 I, for one wears Nigerian club jerseys. The only foreign club jersey I wear is for Liverpool. I have jerseys for Abia Warriors, Dolphins, Sharks, MFM, Ikorodu United, Go Round FC, Remo Stars and Lobi Stars. Whenever I wear I Nigerian League club jersey people ask me where they can get one. No Nigerian club has a shop, not one. The closest is Ikorodu United who at least have an organized way of selling their jerseys at their stadium when they have home games. So I watched these club chairmen in excitement buying Valencia CF jerseys and memorabilia and that question played on in my mind- You can do this for your club. Your stay may not be permanent but leave a legacy that people will remember you by whenever you are replaced by the real club owner, the state government..
On return to the hotel we had launch and while others went back to crash I kept myself busy typing Day 3 of my diary, then I grabbed some shut eye (just one hour though) and got out to join the rest of the team as we embarked on the 30 minute trip to Alzira, venue of the friendly game against Valencia. 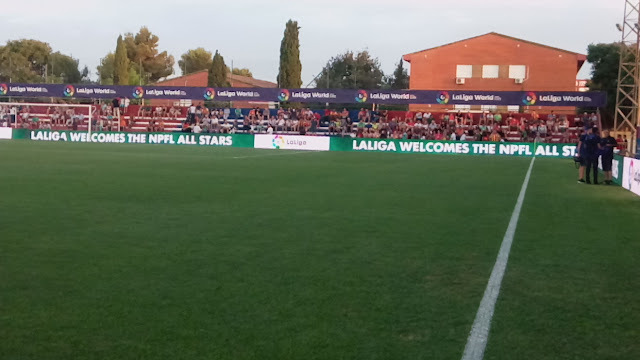 A lot of people asked why the game was not played at the Mestalla but the small stadium in Alzira and it has been answered over and over again. There was a forrest fire that affected the people of the area and the game was a charity one to raise funds for those victims. The people did not take the game lightly either as they turned up in their numbers, filling up the stadium. It was a small community stadium, maybe like the one in Omoku used by Go Round FC (but of cause built better) and every single seat in the stadium was taken. Of course we all watched the game so I’m not reporting that here, just some pointers. The people came out for a cause, filled up the stadium and had fun watching a great game. Can any club in Nigeria actually organize a charity game for any cause and do it this well? At the end of the game there was a pitch invasion by the home fans. 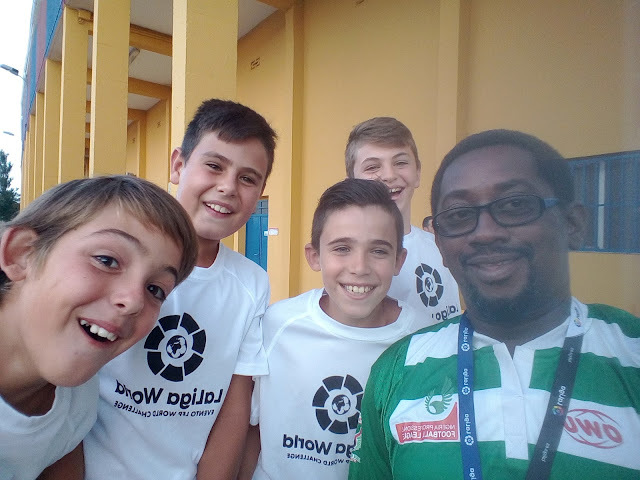 It was their chance to meet their players one on one and as soon as the whistle sounded they ran in, male, female, teenager alike, and they took selfies and signed autographs. I do not think pitch invasion after a game is a bad thing as long as it is done in good faith. 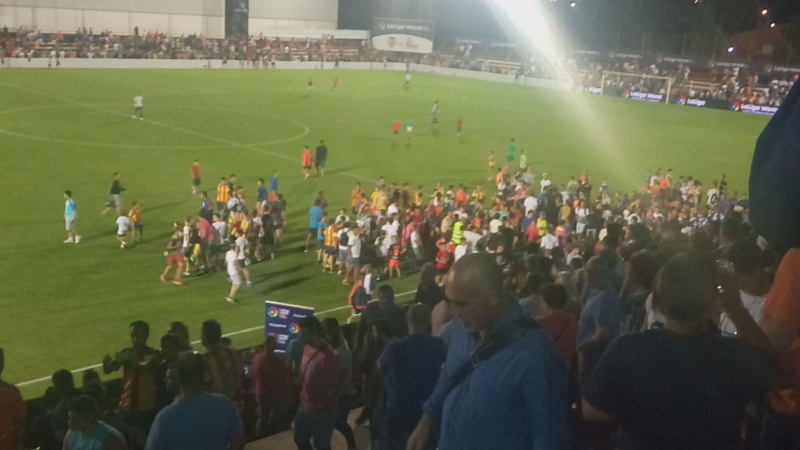 A pitch invasion that disrupts a game is very wrong and should be discouraged, but what happened in Alzira to me showed the people loved their club. In Nigeria we frown against pitch invasion as though it’s an evil thing unheard of anywhere else but it happens even in the most developed of climes. 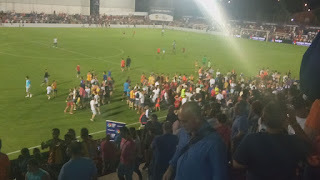 But like I said above, pitch invasion is evil if it is done to cause disruption of a game, beat up the referee or players ut not at the end of a game to celebrate a result and if it is done in an orderly manner like we saw in Alzira and have seen in the English championship every year on play off final day. Finally I saw how “Area” held the team to ransom and they couldn’t leave. We have seen Super Eagles games in Abuja, Port Harcourt, Calabar and Uyo and how the players cannot leave the stadium at the end of the game. Fans would cordon off their exit point waiting just to catch a final glimpse of them since they may not be allowed into their hotel after the game. 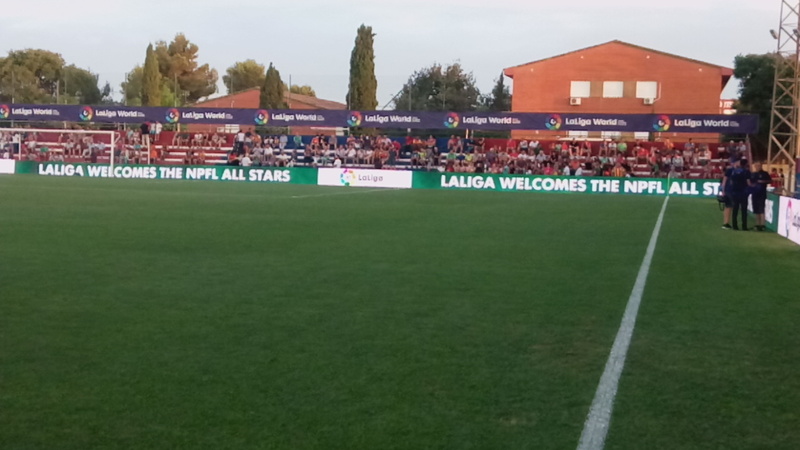 The same thing happened in Alzira as at least five hundred fans waited at the only exit to meet with the players. 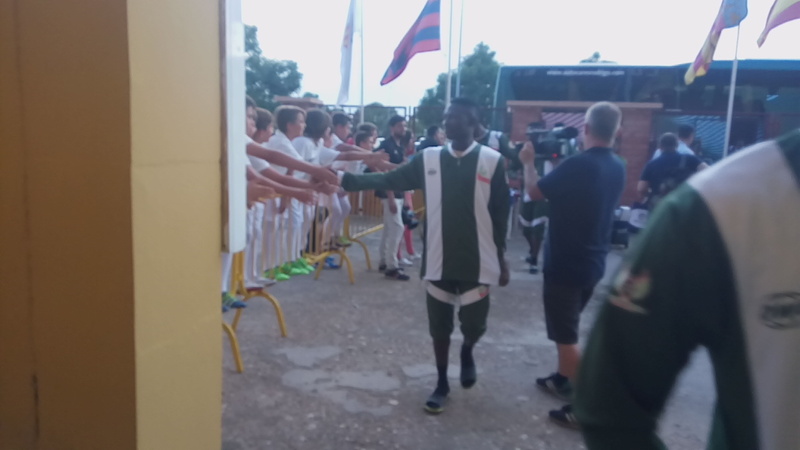 After the organisers waited for about thirty minutes and the fans refused to leave they had to order the team bus to drive out and park just at the exit point so the players could just get out of the dressing room and straight into the bus. Those scenes certainly reminded me of Nigeria where it happens every time the Eagles play and even in League matches too. We went back to the hotel and after dinner, while men slept I stayed awake to edit some audio clips of interviews I did and syndicate to the radio journalists on my mailing list. Tomorrow, we go to Sevilla for the game against Malaga.